Wages in Mexico are regularly blamed for the blood on the factory floor of the Canadian auto industry, but General Motors’ growing footprint there is part of a broader trend that has turned Mexico into an auto-industry powerhouse, say analysts. General Motors is on track to produce one million vehicles in Mexico next year, while its Canadian production would fall to less than 200,000 if the company proceeds with plans to close its Oshawa Assembly plant, industry figures show. Mexico’s wages have become the mantra that trade union Unifor regularly chants in its fight to keep the line running at GM’s Oshawa Assembly plant, which employs about 2,600 hourly workers. GM announced in November that it would not allocate new product beyond 2019, effectively sealing the plant’s fate. Wages are just one nail in the coffin. “The problem is the products that are in Oshawa are on a death watch — the [Chevrolet] Impalas, [Cadillac] XTS and older generation [Chevrolet] Silverados and [GMC] Sierras,” said Joe McCabe, CEO of the consulting company AutoForecast Solutions. As well, he said, GM faces an overcapacity problem in North America. “At the end of the day, GM answers to the shareholders,” McCabe said. “And when profitability is being hampered, you’re looking at your portfolio and what’s not making it. Unifor cites “corporate greed” for GM’s decision to stop allocating product to the plant. “The cost of keeping the Oshawa complex alive is not excessive,” Unifor President Jerry Dias said after a Jan. 8 meeting with GM executives in Detroit, where the company rejected his suggestions to keep the plant open beyond 2019. According to the Center for Automotive Research in Ann Arbor, Mich., auto workers in Mexico earn on average less than US $6 an hour, excluding benefits. Canadian vehicle-assembly workers made an average of $34.85 an hour in 2016, according to Statistics Canada. That’s about US$26.25 at today’s exchange rate. The longer-term trend among global automakers — including Japan- and Germany-based manufacturers — has been to locate new production in Mexico. Low wages, generous government incentives and favourable trade agreements have helped turn Mexico into an auto-industry powerhouse, said Charlotte Yates, the director of the Automotive Policy Research Centre at McMaster University in Hamilton, Ont. GM has been among the biggest drivers of that growth. Its three assembly plants in Mexico produced 837,200 vehicles in 2018, up from 690,400 in 2015, according to Wards Automotive. Over the same period, Canadian production fell to 327,200 units from 577,600. GM continues to operate an assembly plant in Ingersoll, Ont., which builds the Chevrolet Equinox. U.S. production is forecast to dip slightly to 1.9 million in 2020 from 2.1 million vehicles in 2015. GM’s Mexico assembly plants make some of the company’s most popular vehicles, including the Silverado and Sierra pickups, the Chevrolet Equinox and the GMC Terrain. Those two utility vehicles were originally and exclusively built in Canada, Unifor said. The new Chevrolet Blazer, a sporty crossover, is built in Mexico. That decision prompted the United Auto Workers union to urge American consumers to boycott it. 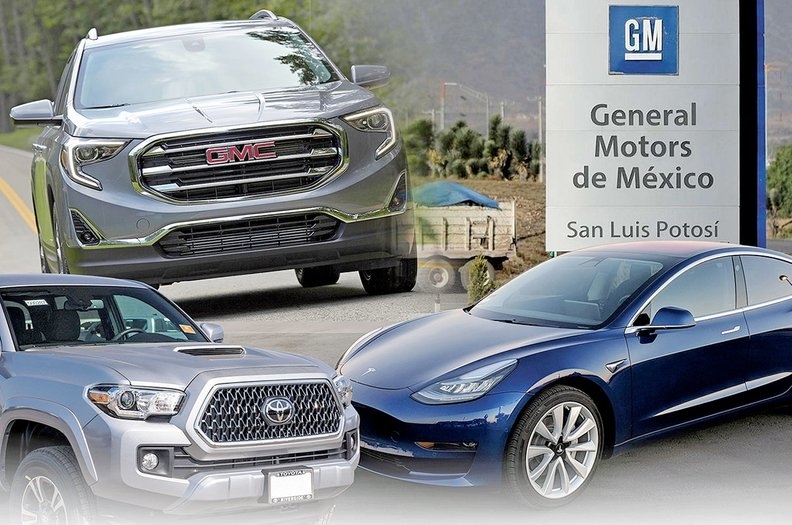 GM is now Mexico's largest auto producer, topping Nissan Motor Co. in a year when it reduced output by an estimated 5 percent in the U.S. and an estimated 33 percent in Canada, according to the Automotive News Data Center. “I think Unifor has a legitimate concern and complaint,” Yates said. However, she cautioned, the situation is “complex.” In recent years, she said, some GM production in Canada has moved to the United States, where it’s harder to argue the labour costs are the main consideration. GM also appears to be consolidating its suppliers and moving them south, Yates said. “Oshawa for some time has become the outer reaches of the supply chain,” she said. The logistics of transporting goods across a congested Greater Toronto Area to the DetroitWindsor border is hard to justify when the rest of Canada’s auto industry is clustered around southern Ontario, Yates said. “This is about GM’s long-term strategy,” she said. “If we’re not producing products that are selling well and gaining market share, then clearly Canada is going to lose out. The Ramos Arizpe complex, which opened in 1981, builds the Chevrolet Cruze small car and Chevrolet Equinox crossovers. It will also build the new Blazer. The Silao complex, which opened in 1995, builds the Chevrolet Silverado and Cheyenne and GMC Sierra pickups. The San Luis Potosi complex, which opened in 2008, builds the Chevrolet Trax, Equinox and GMC Terrain crossovers.